In Style Magazine: Five & Ten featured! As Athens, GA continues to receive accolades, so do restaurants around town! The latest comes as no surprise. 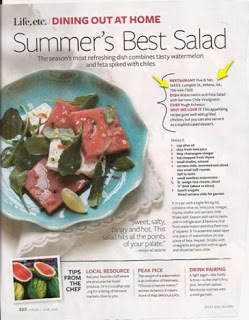 Chef Hugh Acheson of Five and Ten appears in the June issue of In Style sharing his recipe for watermelon and feta salad with serrano chile vinaigrette(I added the oh-so-helpful yellow arrows). Acheson is certainly no stranger to recognition, he has been a finalist in the James Beard Foundation&apos;s Best Chef Award (southeastern region) twice and won the title of one of America&apos;s Best New Chefs in Food &amp; Wine magazine. In addition, Five and Ten was named the Atlanta Journal Consitution&apos;s Restaurant of the Year in 2007. 1. In a jar with a tight fitting lid, combine olive oil, lime juice, vinegar, thyme, shallot and serrano chile. Shake well. Season with salt to taste. Chill in refrigerator. 2. Remove rind from watermelon and slice flesh into 3" squares. 3. To assemble salad, layer one piece of watermelon on one piece of feta. Repeat. Drizzle with vinaigrette and garnish with arugula and sliced serrano chile. While this certainly sounds delicious, I think I&apos;ll make the trip down to Five &amp; Ten and let the professional do the whole cooking part!